If I wait for the sun to come out so I can take a nice picture of the finished Clapotis scarf, it might be a long wait — it’s been wet all week, and we’re supposed to have rain every day for another five days at least. So here it is on this dark afternoon — no contrast, not much color, but it is what it is. Modifications: I made it narrower than the pattern calls for because I had just 400 yards of the yarn. See below. What it is is quite nice, even after all the trouble it gave me. I knit the last section three times before I had enough yarn to finish. So much for my “perfect” 20/60/20% formula, which apparently works only if you actually bother to measure the yarn. Go figure! I think my sister will enjoy it, and I love how it turned out. I’m Clapped out though. Time to move on. And move on I have. I’m on the second chart repeat of my Cactus Rose Shoalwater shawl. I love it — I know that handpainted yarns and lace don’t always go together, but it’s different when the lace is a simple wave stitch like this one is. The colors get to move across the surface without much interruption, which is good, because this Frog Tree yarn has very frequent color changes (3-4″ intervals). Last night while watching “Alias” and “Lost” (and being on the edge of my seat for the whole two hours) I turned my first-ever garter stitch short row heel, on my Sixth Sense sock. I’m congratulating myself because I managed to make a heel without gaping holes. I could have put the sock down instead of trying to knit and pay attention to all the cliff-hanging action on the tube, but you know how it is when you get to the heel-turning part of a sock — it’s practically impossible to stop! It’s a cliff-hanger all on it’s own, isn’t it? It’s time to switch the laundry and do some ironing and packing and Annabelle-coddling, because I’m catching an early flight to Chicago tomorrow. I’ll be back after a “wild” weekend of yakety-yacking and fun with my sisters. Hey, maybe it will be sunny there! Next Is that blue sky? Really? The Clapotis looks lovely (even without the sunny glamour shot). 🙂 I agree that Alias & Lost made for difficult knitting – thankfully I was doing straight knit stitches. Be sure to pack some warm layers for coming out here to Chicago – the rain has moved in & so has the cold. Hmm…surely you’ll be using some of your handknits to keep warm. 🙂 Have a great trip! Oh it is beautiful even with no sun. At least it was a nice soft rain most of today – not like they are saying for the next couple of days (5 inches in two days YIKES) But are you bringing this weather with you or should I say sending it on ahead of you from what amyartisan said?? Have a ball – come back all talked and laughed out. definately yummy clappotis.And I know ‘zactly what you mean about the heel turn. It’s a place where there’s no stopping, sorta like the end of the downhill slope of a ski run ! You simply MUSt continue.. pictures ?? I love the photo of your Clapotis, the colours all blend in perfectly. Congratulations! A short row heel without holes AND a finished object.Isn’t it nice when you get another week to stay bundled up in your warm knitted woolies? Soon it will all be too hot for any woolplay except socks.Have a splendid weekend. A lovely clapotis!We’re having the same crappy weather here in Minneapolis, too. Blech. I’ve been concerned about the weather where you are since seeing the headlines while at PT. eeeks! Hopefully you and rho are both doing well. 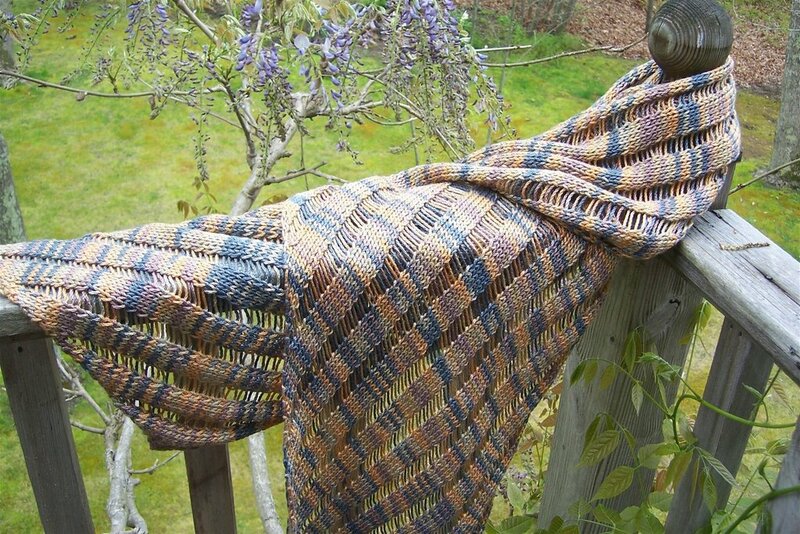 Your Clapotis turned out beautifully. I just finished knitting one and loved the pattern — how much fun is it to drop stitches!